Michael E. Salla, PhD., is the author of Exopolitics: Political Implications of the Extraterrestrial Presence (Dandelion Books, 2004) and founder of the popular website: Exopolitics.Org. He has held full time academic appointments at the Australian National University, and American University, Washington DC. He has a PhD in Government from the University of Queensland, Australia. During his professional academic career, he was best known for organizing a series of citizen diplomacy initiatives for the East Timor conflict funded by U.S. Institute of Peace and the Ford Foundation. 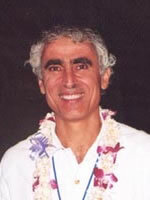 He is the Founder of the Exopolitics Institute (www.exopoliticsinstitute.org ); Chief Editor of the Exopolitics Journal and Convenor of the "Extraterrestrial Civilizations and World Peace Conference" and Co-Organizer of the forthcoming "Earth Transformation: New Science & Technology, Spirituality, Dolphins and Exopolitics Conference."